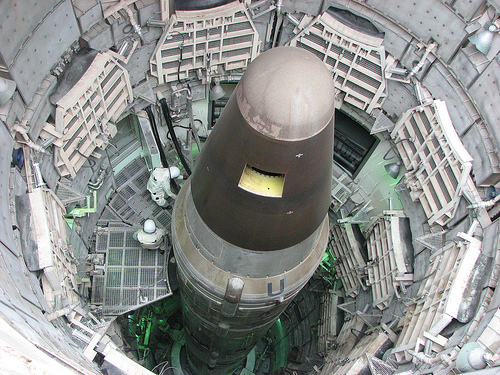 Titan II nuclear missile in its Cold War silo. “Peace Action praises the UN Security Council for highlighting the importance of the Comprehensive Test Ban Treaty (CTBT) which only a small handful of countries, including the U.S., refuse to ratify. Yet, the U.S. cannot expect other countries to refrain from nuclear testing, acquiring nuclear weapons or upgrading nuclear weapons and their delivery systems if the U.S. Senate (especially Republicans) refuses to ratify the CTBT and the U.S. government plans a wasteful, one trillion dollar spending spree on the U.S. nuclear arsenal. Republican Senators have blocked CTBT ratification, thus making the world and Americans less safe. Even worse, some Republicans have threatened blocking funding of the CTBT Organization which effectively monitors and deters nuclear tests. Instead of stopping critical CTBTO funds, Republicans should stop nuclear testing by ratifying the treaty. The last of the United States’ 1,052 nuclear tests was in September 1992. President Bill Clinton was the first to sign the CTBT on September 24, 1996. Since then 183 states have signed and 166 have ratified the treaty. Only North Korea has conducted nuclear test explosions since 1999. The CTBT has not yet entered into force because eight states—China, Egypt, India, Iran, Israel, North Korea, Pakistan, and the United States, also known as the Annex 2 states—have failed to ratify.